Camping Les Sables Blancs är en camping i Concarneau, Finistère, belägen vid havet. Denna terrasscamping har platser med stängsel, med skugga, utan skugga och platser med lite skugga. Camping Les Sables Blancs ligger i närheten av en sandstrand. Det finns möjlighet att hyra husbilar. På campingen finns en lekplats och ett sportområde. För den sportige semestervandraren har campingen olika cykelleder. Det finns ett underhållning och ett fitnessrum. Vem vill inte efter en hård dag slappna av i en jacuzzi. Campingen förfogar över en utomhusbassäng och ett knattebad. I den närliggande omgivningen kan du också simma i havet. I Camping Les Sables Blancs är det tillåtet att snorkla, vindsurfa och åka vattenskidor. Att laga sin egen mat är inte alltid nödvändigt, för på campingen finns en snackbar, en pizzeria och en restaurang (med stort urval). På campingen kan du också köpa färskt bröd. Det är möjligt att komma ut på internet, därför att på 80% av campingarna kan man komma ut på internet med egen laptop. Denna inspektör gör varje år ett besök på Camping Les Sables Blancs och inspekterar campingen för ca 200 faciliteter och för andra förekommande punkter. Inspektören är en medarbetare från ACSI och arbetar inte för campingen. Brilliant site. High quality restaurant and bar. Great pool and jacuzzi. Nice walk into centre of Concarneau via the wooded pathways accessed directly from the site. Huge E. Leclerc hypermarket also within walking distance. We arrived at the tail end of the season and all facilities still open. Cannot recommend highly enough. Fantastic campsite. This year was my 4th year staying here. This year was the third visit. Excellent location with footpath into town easily accessible. Friendly staff and very reasonably priced with ACSI. See below for full comment. We booked in advanced and choose the area of our pitch which was kept for us. We have been three times as it is one of the best! Stopped for one night - stayed 3 weeks. Our pitch was very comfortable and pleasant, although some were relatively small. Access could be difficult for a large caravan as some of the site roads are somewhat tight and steep. Close to a good beach and excellent coastal walks from the site. Excellent touring base for a beautiful part of Brittany. Very busy site although no problems. Beautiful restaurant and bar looking out to sea. Highly recommended. A lovely campsite set in easy reach of the town and the beach. Not too large and the staff were very friendly and helpful. They even booked the vet for me for the dogs pre return to the uk examination, before we arrived at the site. Loved it will return if we are in the area. We found access into the site was quite tight for some of the motorhomes and caravans in our group. We had pitches in the rear of the site and manoevering on the site to get to the pitches and onto the pitch is difficult due to the small size of the access roads and some of the pitches. Site is located close to town and the reception and bar area is modern and well situated for views over the town and towards the sea. Toilets and showers were generally pretty good. When wet (as it was when were there) the pitches soon became waterlogged and very soft with little (if any) drainage. We loved this campsite - great facilities, good restaurant, bakery to order, free WiFi, walk/cycle into Concarneau, friendly staff, warm, clean washblock with toilet paper and seats! Pitches not huge, but we had a sea view. Definitely on our list to return to! We chose this site for a one night stop over so wanted all amenities on hand, this we had but what an awful, over busy, cramped site. We found it with difficulty, and parked as requested in the arrivals bay, but then couldn't get through gate without backing up, difficult when others arriving back from day out behind us.The roads between the pitches are only the width of a car the pitches so small that if an awning was up the vehicle had to be parked along the front edge causing more manovering problems for others. Fortunately we had help placing the caravan, had to be done by pushing it in as not room to turn in with car, great trouble towing out next day. Showers cold and toilets by 6pm needed to be cleaned. We shall not visit this site again. Vill du boka campingen Camping Les Sables Blancs eller få mera information? Det går bra med nedanstående uppgifter eller via campingens webbsida. 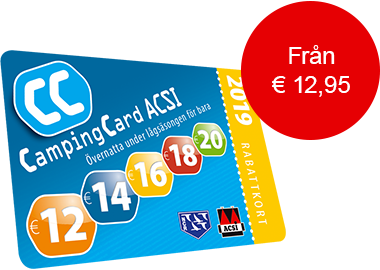 ACSI Eurocampings skickar din informationsförfrågan till "Camping Les Sables Blancs".